The Komodo National Park is one of the parks that are available in Indonesia. The park covers or include many Islands in Indonesia to name them they include the Rinca, Komodo, and Padar plus many small ones in figures it approximates covers more than 600 km2 of land. This one of the selected view nature wonders was founded in the 1980s with aim of protecting a kind of dragon called Komodo which by then was the largest world known lizard, later the Komodo National park was declared UNESCO World Heritage. The park is a home of the Komodo Dragon which is also known as the Komodo Monitor, apart from the monster, the park is also a home to many notable species which are terrestrial and marine in nature. The Komodo National Park so its origin back in 1980 this was further supported to be a World Heritage Site. The Komodo park main aim of the establishment was protecting a kind of dragon called Komodo which by then was the largest world known lizard, later the Komodo National park was declared UNESCO World Heritage. This Komodo dragon scientifically known as Varanus Komodoensis was initially sighted by scientific J.K.H. Van Steyn in the year 1912. Interesting since the discovery many more of the international conservatives have added their voice of protecting the Komodo park in Indonesia, both terrestrial and marine. On the Lesser Sunda Islands lies one of the selected must visit New7wonders of Nature, This wonder is surrounded by an endless list of marine life thus another wonder which is the water that surrounds the Komodo Island. The Komodo National Park is one of the parks that are available in Indonesia. The park covers or include many Islands in Indonesia to name them they include the Rinca, Komodo, and Padar plus many small ones in figures it approximates covers more than 600 km2 of land. When it comes to leisure and traveling, then the first choice should be in Indonesia for the Komodo National Park, Flores, and even Island it is always great to note the nature in terms of climate and geography of the area one wants to visit. The Komodo National Park, Islands in Indonesia are located in the coastal part of the Flores, the islands are surrounded by waters, and most of the islands are volcanic in natures as they were formed from volcanic activities. In terms of terrain, the area covered by the Komodo national park and the island is tough and has hilly areas and is characterized by rugged nature. The climate of the Komodo National park, the Flores in Indonesia is one of the driest of Indonesia and with rainfall which ranges between 800 and 1000 mm annually and with mean temps of about 40 ◦c. In summary, the climate of the Komodo can be described as hot and dry. The topography of the Komodo National Park, Indonesia, Flores, and Island has slope ranging between 0 to about 80% while exploring this we note that the ground around this scenery has less flat services near a beach, furthermore, the altitude ranges above 750 mm up to the highest peak of Gunung Satalibo on Komodo Island. Most of the Komodo park area is positioned on an active volcanic belt which technically is between Australia also to note in a geography of the Komodo National Park, Flores, and the associated Islands in Indonesia is the outstanding scenery, unique beauty, and the unique creatures. The terrestrial animals that are species are not as much compared to other places. The Park is important in term of conservation of the perspective due to the nature of some species which can be described as endemic. Well, known is that the origin of many of the mammals is the Asiatic while for the birds and reptile that are available in the area are of Australian origin. To name but a few are Orange-footed Scrubfowl, Nosy Friarbird, and Lesser Sulpher-crested Cockatoo. Of the most fauna, the most famous are the Varanus komodoensis which is known as the Komodo Dragon, this monster lizard weight more than 70kg and its length surpasses three meters. The dry and hot climate of the Komodo national park and the Flores and the islands in Indonesia have characterized vegetation of savannah types and thus making a good area for the endemic Varanus komodoensis or the Komodo Drag. In terms of numbers, the monster lizard is extinct on the Padar Island, while there are two thousand on the island of the Flores, one hundred on the island of the Gili Dasani similar amount of the Gili Dasani on the Island of the Gili Motang, one thousand and three hundred on the island of the Rinca and finally on the island of the Komodo there are one thousand and seven hundred all being in the larger Indonesia. In terms of forests in Komodo National Park and Flores in Indonesia, there appears a cloud forest few places which are above 500 meters which are few and thus they act to provide habitat to numerous of the endemic flora. In the Coastal region of Indonesia, there is a popular vegetation's which includes the kind of mangroves forest, and which tends to occur in the covered or sheltered bays of the 3 Komodo National Park islands in Indonesia. The coral reefs that are the kind of fringing and patch kind cover a larger part of the coast of the Komodo, the reefs are well developed. The reefs of the Komodo Park are well developed. The national park has an extensive cover of marine life talk of Sharks, Whales, Manta Rays, Ocean Sunfish, Coral, Eagle Rays, Tunicates, Blue-Ringed Octopus, Pygmy Seahorse, Sponges, False Pipefish, Nudibranchs, and Clown Frogfish. The inhabitants of the Komodo Park and the associated islands both in Indonesia also includes the varieties of the known Cetaceans, this includes the large-sized kind of blue whales, the known sperm whales, and the small dolphins, not forgetting the Omura’s Whale. Of our interest is the one which is not well known called Rorquals and which have been known to range from the waters surrounding the Komodo park that the islands surrounding the park. It is better to note that one of the endangered species known as Dugongs lives in the Komodo National park areas. The fauna is of rather not well diversified in Komodo National Park and Flores in Indonesia, when compared to the fauna both in the Komodo Park and the surrounding islands. The above fact is noted as the number of the animal which is terrestrial found in the Komodo National park is that high, but the park is of importance as it is used to provide a protective area for the endangered species. In addition to the marine fauna, there are flora species of the snake which can be found in the in Komodo National Park including the associated islands and Flores in Indonesia. To name them they include endemic Komodo Cross Frog, Asian Bullfrog, Blue Lipped Sea Krait and the Javan Spitting Cobra just to name a few kind of frogs which are found at a notable higher area of the park and areas which moist climates, another notable terrestrial animal is the crocodiles such the Saltwater Crocodile which was available but currently extinct. Not to be left behind is the mammals in Komodo National Park including the associated islands and Flores in the Indonesia, which are found within the park such include, the most notable of the Komodo park which the Komodo dragon, wild boar, Timor Rusa Deer, Asian Palm Civet, Crab-eating Macaque, Water Buffalo, Horses, Fruit Bats, Rinca Rat and off course one cannot miss the availability of the domestic animals such as goats, dogs and even cats which are wild. For the birds the in the Komodo National Park including the associated islands and Flores in the Indonesia, is a proud host of many species of the birds, with the notable species being the Orange-footed Scrubfowl, the Zebra Dove, and the Spotted Dove, Dwelling Bird and Eagle species which includes the Flores Hawk-Eagle and of which its presence is notable of the Flores and Rinca but its availability on the Komodo Island is not known. 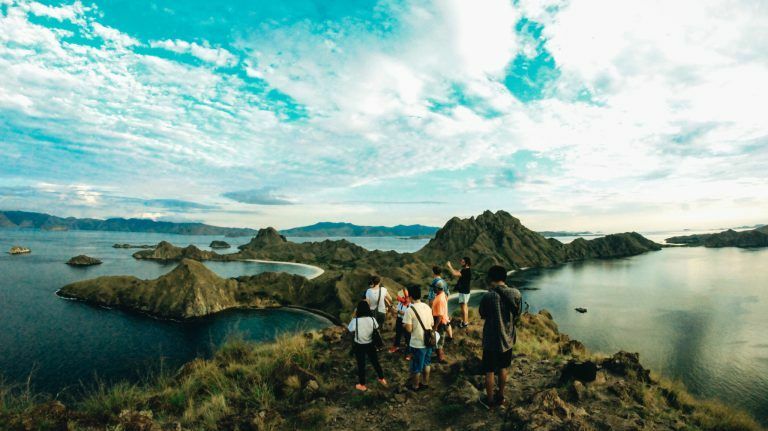 Starting with the two major Komodo National park islands that the island of Padar and part of an island of Rinca they were founded as Nature reserves back on the earlier 1930s, but later at 60s the bigger komodo island was declared also a Nature reserve. There was an extension of the reserve coverage as a push by the UNESCO World Heritage Site back in 1991. Since the start of the year 1995, the Komodo National Park Authority has had numerous support by the International community such as the Nature Conservancy (TNC) and another America organization known as the American Environmental Organization. There were a management co-authoring and implementation back in the year 2000 which was meant to solve the troubles or the problem of increased exploitation of the park resources and especially the terrestrial and the marine life terrestrial. Most notable of this exploitation was the by the fishing communities and the commercial enterprises from outside the Komodo park. Which greatly exploited the marine life. The park introduced regulations and the restrictions on both marine and terrestrial life can mostly impact on Komodo national park residents, who may have fewer options to make a living but opt to rely on what the Komodo national park would offer and thus the provision of other ways of catering for the lives of the residents is one of the management strategies whose decision has not benefitted the members of the communities surrounding the park. About 4,000 people are the one who dwells within the park. For the most of the inhabitants who are located in and around the park there are less fresh water facilities that may be needed by the population that is available and especially during the dry periods, also notable is the quality of the water which drastically lower during the dry seasons also, this result to many becoming ill and in particular the Malaria disease and the diarrhea are common in the park area. In terms of education level, there are little advances, in fact, the notable level is a four-grade elementary school, and few people of the Indonesia Park do not graduate from those elementary levels and the few who do are sent to other places for advances of their education. There are various sites in the Indonesia Komodo park and Flores which may be described as being cultural in nature within the Komodo national park and in particular the Komodo Island as one of the islands in the park the cultural sites noted on this park are noted well recorded that is documented, this, as a result, has resulted in a lot of speculation about the human availability in the park. In one of the villages that are available in the park that is the Warloka village on Flores, there can be noted a Chinese trading post and as a result, the Archeologists can now find that from this site there is a lot to learn from. In terms of language, most communities can well speak the Indonesian language and there is also a Bajo language that is used in most of the daily activities work and by most of the communities. It is always great to know the kind of people one expects to get and especially when visiting a new area. As noted many inhabitants of the Komodo Park associated islands and the Flores in the Indonesia area are Muslims, these are the majority who are fishermen and who lives in the park villages. Another notable religion in this area is the Hajis who have a heavier influence on the nature of the community list of development in the park, to add onto your knowledge the Fishermen who hail from the South Sulawesi and the Bima are also most them being Muslims. Christian’s community is available in the Manggarai. For leisure that is a lot of fun here, with a diving mask for instance when one open the eyes. One would meet a lots fun, for instance, imagine meeting Manta Ray, such a bigger than you animal, it could take away your heart or even stop it for a while, but out of your expectation, the Manta Ray does not go away but rather play, dance and even swim together with you. Actually, there is a lot of more and more fun in this park one would not miss attending and at the center of the Komodo national park is an island that is in the front garden. It is a great and amazing experience you may have met in your whole life. Among the notable leisure one may get in the Komodo Park and Flores in Indonesia is diving, this is attributed to the fact that the park is very popular with the marine life thus high marine which is diversified. As a part of the park management to make a sustainable development in the park that makes all the activities of the park to be self-financing then there comes the development of, widely marine-based kind of tourism with main strategy being how make the Komodo National park and the associates a self-financing by having to generate sufficient revenue through channels such as the entrance fees and the licenses such as the one for tourism all which can be used to cover for operational and even the cost of management within the park. To arrive at those concluded agreements then there were formed a joint businesslike kind of agreement between the TNC and a park tourism operator who both granted concessions to both parties that were involved, that all added and also provided with the management all the rights that are required for the park operation. And although this agreement has been meant to help the park sustain itself and bring a positive result to both the park life and the community it has been hit by a controversial of a decision. There have been claims that the decision being arrived are made from back doors and it is not backed up by the community who claim it negatively affect their lives. The Komodo national park and the associated Islands of the Komodo and the Rinca were known part of Flores and off course, they now differ from the large Island of Sumbawa which are in the west of the park by the Sape Strait. In terms of visitors, the Komodo national park has a known large number of visitors such that in 2009 there were 36,000 known visitors who have visited the area and that number become large to about 45000 in the year 2010. This number of the visitors is according to as the park can accommodate more than this visitors. In the Komodo areas, tourism boats do exist which cut across the park using short trips and are reliable, they, in addition, have a known safety record. In Komodo National Park, Indonesia, Flores, Island there are a lot of fans such as Kayaking and camping. Due to the famous great features which are found in the area and with the record of being the largest on the planet, that is the Komodo dragons ,the chain of the islands in the Komodo area offers much more and not just those such include the sandy white beach, the reefs and the much of the islands which are not inhabited, The many features of the park may not be accessible to by the big vessels such as the larger boats ,but that does not mean the end of your leisure and travel in the park, there are other alternatives available there such as the kayak off the sea which can be used to travel anywhere such as into bays some rocky areas and even slowly where the reefs are shallow. Lodging and accommodation facilities in the Komodo national park islands. At the Labuan Bajo, Flores there is an affordable place one can relax. For the drinks and food, it is not recommendable to trap any water and have it for drinking, it is advisable to buy drinking water and have with you so that it can save your needs. it with the Western standards. Within the Indonesia beautiful scenery of the Komodo park, Flores, and the associated scenery, we cannot exhaust all of the good stuff that is available, but rather we can invoke the feeling. For instance when one of my friends visited the place how in the In the afternoon after setting their foot on Komodo Island which is one of the larger Komodo national park and without forgetting the largest island in Komodo National Park, They account how immediately they docked they could get the grasp of the Komodo monster that is they already could see the Komodo dragons in action. Finally, while in Komodo National Park including the associated islands and Flores in Indonesia It is always to stay safe by always adhering to the set security features sets .know is the history of the dragons of attacking humans and thus apart from those, it is always important to stay safe and seek the local advice. Stay by the advice of your guide by for instance not getting too close ask for a guide from the relevant authority and always stick close to them or him. It is not necessary to wander around as this might pose a large danger onto you. To many, the main reason as to why they may travel to the island, Flores and the associated scenery in Indonesia is to have a touch or a look to the famous dragons, the beaches and of course the unspoiled coral reefs. It is advisable to always keep your goal of visiting the park at a close level with you.